Many bump stocks were made in a Texas facility, which has said it will shut down, following the federal ban on bump stocks. 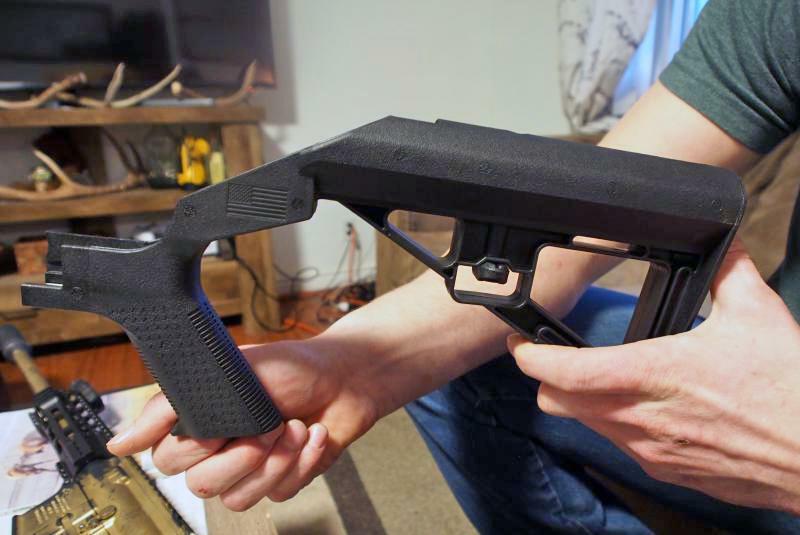 Gabriel Hodge holds up a bump stock, a plastic attachment that turns a semi-automatic rifle into a virtual machine gun. Bump stock owners, like Hodge, are in limbo after the ATF ruled the devices are illegal, a decision that has been challenged in court. A federal ban on bump stocks represents nearly unprecedented firearms regulation, the kind that concerns even some gun rights proponents who don’t like the devices. But even if the government’s blanket order to get rid of bump stocks, issued Dec. 18, survives legal challenges from gun rights activists, it will be nearly impossible to enforce. In the meantime, some bump stock owners are using their attachments before they lose them. On a recent trip to the scrubland south of Boise, Idaho, John took aim at a bullet-pocked piece of particle board in front of a barren hillside and did something that could soon be a felony. He fired a rifle outfitted with a bump stock. John asked to be identified by first name only, due to concerns his employer may think he’s dangerous because he owns the controversial attachments. Bump stocks modify semi-automatic rifles, which normally fire one round per trigger pull, to simulate automatic, or continuous fire. To use a bump stock, gun owners need only remove a few screws, take off the rifle stock and replace it with the bump stock. At the direction of the Trump Administration, the Bureau of Alcohol, Tobacco, Firearms, and Explosives (ATF), re-classified bump stocks as machine guns, making them illegal under the National Firearms Act (NFA). That reversed the ATF’s Obama-era decision not to regulate the devices. If the courts uphold the rule, anyone who owns a bump stock must destroy it or turn it in to an ATF office by March 26, 2019. The ban does not grandfather-in anyone or provide for compensation for the devices, which typically cost $150-300, but can run as high $500. That marks this ruling as a completely new way of regulating guns and a scary development for many gun owners. Machine guns, for instance, are technically legal, but highly regulated under federal law. An amendment to the NFA in 1986 mostly outlawed a class of weapons that include machine guns produced after the change. However, those weapons that were owned before the amendment were grandfathered-in and can be legally owned with proper licensing. Bump stocks have no serial numbers or registration, so no one even knows how many are out there. Estimates run into the hundreds of thousands. Because of this, experts doubt the ATF can enforce the rule in any meaningful way. “It’s basically going to be the honor system,” said Michael Bouchard, the ATF’s former assistant director for field operations. Still, John says he’ll comply. One reason John is leery of being connected with bump stocks is because the devices gained infamy after a gunman used them to fire from a Las Vegas hotel room into a crowd of concertgoers in 2017, killing nearly 60 people and injuring more than 800. It remains the deadliest shooting in modern U.S. history. Boise bump stock owner Gabriel Hodge reflected a common view among gun owners: the devices are difficult to use, inaccurate and hard to control, but they unload a lot of lead quickly. The ATF declined to comment on the ban, instead directing anyone with questions to the bureau’s bump stock fact sheet. The page includes instructions on how to destroy bump stocks and where owners can turn them in. To turn them in, owners must find the nearest ATF office. Local law enforcement stations won’t suffice. The ban has left some bump stock owners like John feeling betrayed by a president who ran on a platform of protecting gun owners’ rights. Bump stock owners interviewed for this story think the ban might be a sop to gun control advocates, keeping at bay more sweeping legislation. “I think [Trump is] doing this to give him a little bit more time, keep the sharks at bay,” Hodge said. The ban could be moot if a lawsuit challenging the ban is successful, and Bouchard, the former ATF assistant director for field operations, thinks it might be. He said the government put the ban on shaky ground by not going through Congress to outlaw bump stocks. For now, owners like Hodge and John face a stark choice: get rid of the once-legal items that may have cost them hundreds of dollars, or commit a crime by keeping them. Even though both say they’ll comply with the rule, with no way of tracking bump stocks, the government might never know if other owners make the same decision. This piece was originally published on KERA. KERA is part of Guns & America, a national reporting collaborative of 10 public media newsrooms focusing attention on the role of guns in American life. You can find more Guns & America coverage here, and learn more about the collaboration here.